MCCC to Host 9-11 Remembrance Ceremony Thursday, Sept. 11, 11 a.m.
MCCC to Host Remembrance Ceremony Thursday, Sept. 11, 11 a.m.
WEST WINDSOR – Mercer County Community College (MCCC) and the County of Mercer invite the community to attend an annual ceremony in remembrance of September 11, 2001. The event is set for Thursday, Sept. 11 at 11 a.m. at MCCC’s West Windsor Campus, 1200 Old Trenton Road, in the Commemorative Garden adjacent to the Student Center. In the event of rain, the ceremony will be held in the Student Center. Participating dignitaries will lay a wreath on the college’s memorial bench. Special tribute will be paid to the 30 Mercer County residents who died in the attacks. Guest speaker is Major Emma Swearingen, Commanding Officer of the Division of Human Resources for the New Jersey State Police. 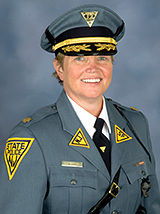 Swearingen has more than 26 years of experience with the NJSP, with a diverse career that includes numerous supervisory positions in some of the organization’s most elite units. Additional speakers include Mercer County Executive Brian M. Hughes, MCCC Board of Trustees Vice Chair Shamil Rodriguez, and MCCC President Dr. Patricia C. Donohue. The invocation will be given by Rev. Robert Wittik. Two MCCC Music students, Celina Hicks and Irvel Jean, both of Hamilton, are the featured singers for the ceremony.